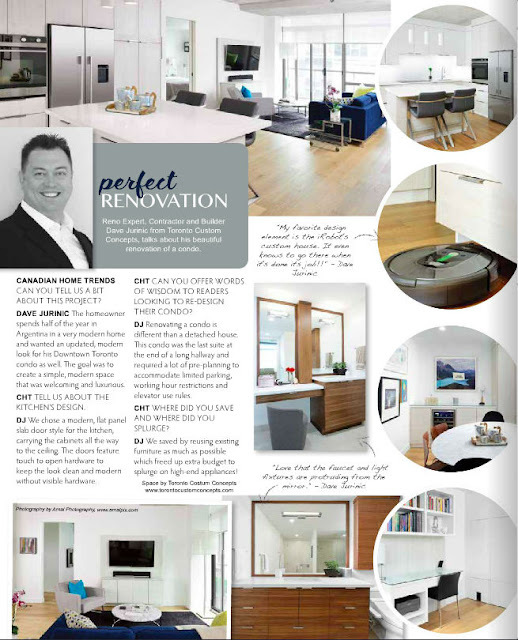 Dave Jurinic of Toronto Custom Concepts is highlighted in the latest edition of the popular home renovation magazine, Canadian Home Trends. Dave is interviewed and discusses Toronto Custom Concepts last condo renovation project at an executive condo at Toronto's prestigious Thompson Hotel residences last month. Dave Jurinic discusses working with our client and their design and renovation goals and style preferences. The project came out as a major success for both our client and TCC. Check out this preview of the magazine revel or go ahead a pick-up a copy of Canadian Home Trends magazine for yourself today! Hope you enjoy!